Seoul’s alleys are filled with eateries specializing in particular dishes. The Korea Herald takes you on a foodie trip to narrow alleys where decades-old establishments beckon diners with their secret recipes, often handed down through generations. - Ed. Yongdu-dong is not a well-known area of Seoul -- not even for local residents of the capital. It is not a tourist destination and it is certainly no hip neighborhood. Nonetheless, the name has been familiar for foodies, who associate it with the image of jjukkumi, or short-arm octopus. 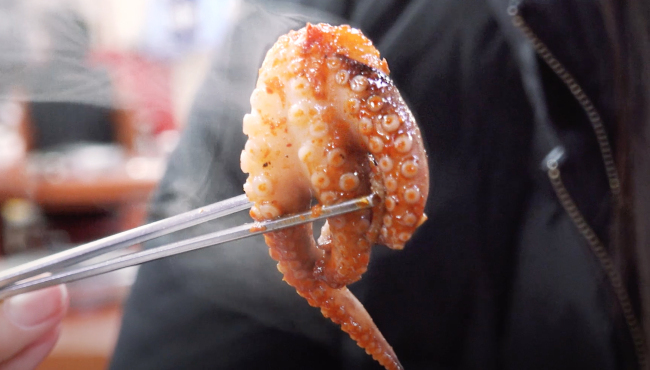 Even those who may not know where the district is located are aware that it is famous for its Jjukkumi Street, a cluster of restaurants serving the spicy short-arm octopus. This variety in octopus is relatively small, usually smaller than one’s palm, with a bulbous head and short tentacles. Chewier and cheaper compared to other varieties of the cephalopods, jjukkumi is a springtime delicacy. Located near the Dongdaemun shopping district, Yongdu-dong Jjukkumi Street is accessible from Jegi-dong Station on Line 1. To help visitors navigate, a large jjukkumi-shaped statue greets visitors at the entrance with its golden beam. Around 20 jjukkumi specialty restaurants are spread throughout the area. Some of the restaurants have even developed into small chains with up to three branches in the area. 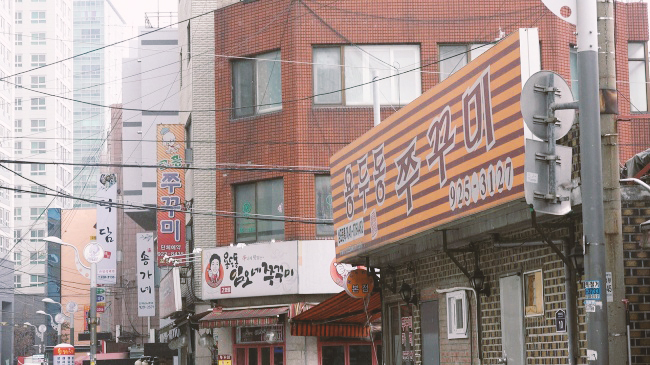 The story of how jjukkumi restaurants came to Yongdu-dong goes back to the 1980s when restaurant owner Na Jeong-soon served lunch for factory workers in the area. One of the dishes, stir-fried jjukkumi was especially popular among the workers, leading to Na changing the main item of her restaurant. Following her success, more restaurants opened up in the area to serve the same dish. By the ’90s, the number of eateries had increased to 10, forming a cluster of restaurants. Yongdu-dong’s Jjukkumi Street proved highly popular in the 1990s and 2000s, but its past glory has now somewhat faded. Barring the most famed restaurant, owned by Na, the remaining can often be seen empty at most hours. The jjukkumi dishes sold in the area are cooked in the same style, regardless of the restaurant. 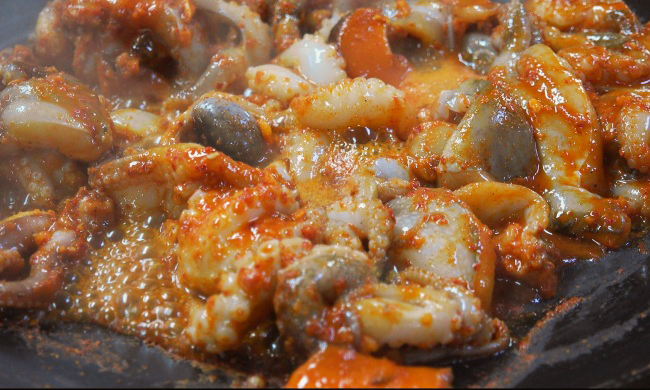 The stir-fried jjukkumi is heavily doused with gochujang, or red pepper sauce. Brought to the table raw on a pan, diners have to wait for the marinated jjukkumi to cook fully. The mouthwatering sight and aroma make it difficult to wait, arousing patrons’ appetites. Fiercely spicy, the smell arouses a cough. Once inside the mouth, the sauce could almost burn the tongue. That is when the kelp noodle -- made with a jelly-like extract of edible kelp -- salad with mayonnaise kicks in, dousing the fire with its cooling properties. After devouring the petite sea creatures, it can be considered almost obligatory to stir-fry rice with the leftover sauce. Beware, the strong smell of the jjukkumi lingers on hair and clothes, sticking around for hours. But it is well worth it. After all, spice is a great stress reliever -- or so goes the common wisdom shared among Koreans.